Artbeat 2016 owes its success to all our sponsors and supporters. We thank them all for their generosity, and hope that you will support them in return. We are delighted Callagher Estate Agents has returned as Principal Sponsor for Artbeat 2016 for a fourth year. The agency continues to play a vital role in the success of Artbeat, and we thank them for their support of our local community. The Royal Hotel Leichhardt﻿ ﻿has returned once again as the beverage sponsor, supplying all the wine and beer for the night. Mark will also be on the chocolate wheel, so come and join him for a spin! Parents of St Fiacre's and its community play a vital role in Artbeat, as they have been busy obtaining donations from local businesses and its community. 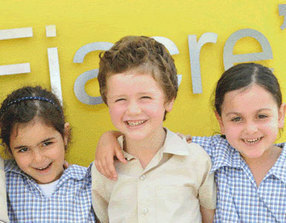 St Fiacre’s Primary School is a small Catholic school in Leichhardt with over 120 students from Kindy to Year 6. It's goal is to ignite the imagination, passion and curiosity of our children. A considerable amount of time and effort is invested to provide the best resources for our children, which requires continued support from our families and our local community. In the last year, our children have benefited from the refurbishment of the playground which comprised of the new seating, grass areas and miniature soccer field. Technology is a strong feature at St Fiacre's and allowed children to gain the right tools of today's learning, creativity and collaboration. The School's Parents and Friends Association's fundraising efforts are integral in assisting the school to make these changes. We will continue this important work for our children and their community. The funds are being used to continue the playground project.